I thought the 22-point spread was a bit insulting to poor Notre Dame. In the end, Purdue should have won by much more. 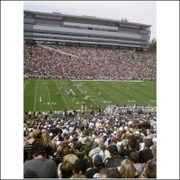 I got to spend yesterday afternoon at Ross-Ade Stadium watching Purdue beat up on the Notre Dame Fighting Irish. This in-state rivalry always brings out the funniest t-shirts and banners. One of my favorites from this year was a large sign at the game which read "Even Rudy Could Start On This Team." Purdue was fortunate to escape with a win though. After getting well within the red zone several times in the first half they wound up settling for far too many field goals, although it was good to see Chris Summers knock 'em all down. Trading 7's for 3's allowed Notre Dame to get back in the game in the second half though. Of course, despite their 5-0 record, Purdue fans know this isn't a second-half team; lots of yardage and points have been given up by Brock Spack's defense after halftime. This game was no different.